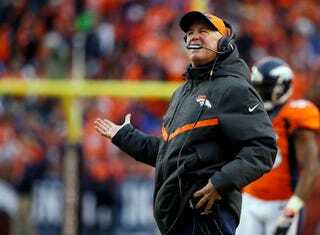 The Denver Broncos dropped out of the playoffs after one game, and today, the team and John Fox mutually agreed to part ways with the team. It's the nice way of getting fired! Glazer hinted yesterday that Fox could be out if Denver lost to the Colts. The team could fill the position with people they already employ. Offensive coordinator Adam Gase and defensive coordinator Jack Del Rio have been looking for head gigs, and they know the team well. This is just the first step of a potentially drastic offseason for the Broncos. Update (5:56 p.m.): Uh, never mind about Gase and Del Rio, according to this tweet.